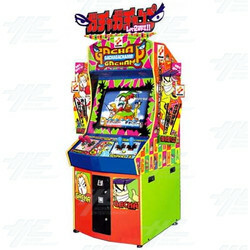 Gachaga Champ is an arcade machine released by Konami in 1999 as part of the Bishi Bashi series. It is a collection of mini-games and puzzles for all ages. Players can take the challenge solo or go head to head with another player. Players use joysticks and an action button to compete in a wide variety of challenges. Mini-games include cooking games such as having to make a burger, and music games including a game where you play air guitar. The machine includes over 40 fun and addictive mini-games! With their simple game play and versus mode (either human or CPU-controlled) players get endless hours of competitive fun out of these cabinets. Players use joysticks and an action button to compete in a wide variety of challenges. Mini-games include cooking games such as having to make a burger, and music games including a game where you play air guitar. The machine includes over 40 fun and addictive mini-games! With their simple game play and versus mode (either human or CPU-controlled) players get endless hours of competitive fun out of these cabinets.